Below is a short list of the most common Laptop Repair Services that we offer at our Tech Repair Center. We also accept laptop repairs shipped from out of the area to our Tech Repair Center. Simply ship your laptop to Orange County Computer and we will provide you with a diagnosis, estimate and repair. Expedited shipping options are also available. 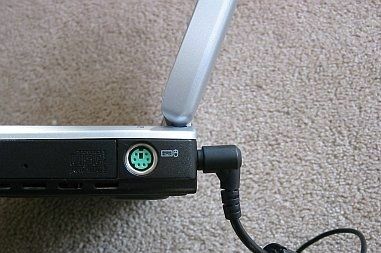 One of the most common laptop repairs we encounter at Orange County Computer®, Inc. is the DC Jack (the plug that powers the laptop). The laptop will not accept external AC Power. The system runs continuously on the battery, until the battery dies. You have to move the power cord around until it starts accepting external power. There are several factors that contribute to this hardware failure. The two most common are poor handling and poor design. Avoid stretching the power cable to its furthest length at anything but a straight angle. Bending the power cable with enough pressure will damage the DC Jack. By keeping slack on the cable or using a straight angle will prevent pressure applied directly to the soldering supporting the DC Jack. Opening and closing a laptop often enough can cause the hinges to become loose and sometimes brake. Our Technicians can replace or repair hinge assemblies as well as the Bezel or Touchpad. When the LCD display fails to function, it can be a big inconvenience. Our competent Tech Team can find the proper replacement from one of our reputable vendors and offer you the best price for a quality replacement screen. We realize that the cost for a screen replacement isn't the most inexpensive repair, so we will also work with clients on an individual basis to provide the best solution to get the system back up and running. Sometimes we can find a used or pulled LCD part which can save costs significantly. Have you ever spilled a beverage on your laptop? If you do, remember to unplug the AC adapter and remove the battery. Turn over the computer and 'shake out' the excess fluid. Then call us for Emergency Service. If you act quickly, you won't have to struggle to find laptop parts that simply might not be available or undergo a repair that is not financially feasible. It is imperative that you do not try to use your system without a complete inspection. Many times the system will work for a short while then crucial hardware components such as the Motherboard or hard drive will fail without any notice whatsoever, then it may be too late to save your valuable data files. A technician will identify the cause of system crashes, lockups, slowness, or Internet problems. Repair operating system issues. Remove viruses and spyware. Install critical updates. Perform optimization for greater computer speed and performance. Provide estimate for recommended hardware repairs or upgrades if needed. A technician will repair, troubleshoot or install one software title such as Word, Excel, Quicken, Photoshop, or Outlook etc… Install all critical updates for software. Import up to 100MB of data into the application if upgrading. Properly configure the software settings. Our optimization service includes over 100 system tweaks that will shorten your computer’s boot time, delete unwanted files and remove unnecessary background processes. A technician will update your system and provide you with critical system updates to protect against security threats. A technician can install any one internal or external hardware device onto your desktop or laptop. We will also install the corresponding software and configure that device to your needs. Examples include: Graphic/Video Card, Memory, Hard Drive, CD/DVD Drive, MP3 Player, Scanner, or Printer. A technician will repair, troubleshoot or install one Software Suite that you have purchased (e.g., Microsoft Office, Adobe and QuickBooks, etc.) Install all critical updates, Import up to 100 MB of data into the application and if upgrading, configure the software to your needs. Click here to view the Software Applications that we support! A technician will install any version of Microsoft Windows XP, Windows Vista TM , Windows 7 or Apple Operating System that you’ve purchased, Install all critical updates, install any drivers required, and configure the software to your specifications. Having a certified solder technician on staff allows us to repair several components, Motherboards, DC jacks, USB ports, Fans and Capacitors. Fixing the part and not having to order it can provide huge savings to our customers. This allows us to get your repair done in a shorter amount of time. Opening a simple attachment in your email from an unknown source is one of the most common ways to contract a virus, and if your work revolves around contacting your customers, or even family and friends, you need a fool proof plan! We offer several preventive solutions that will ensure a safe haven for your browsing needs. Already have viruses? Then bring your system in for a software evalution and removal. For more information on where you can start on your virus prevention plan, click hereto read helpful tips! Lenovo, IBM, HP, DELL, Sony, Toshiba, Gateway, Samsung, Fujitsu, Acer, Apple and Alienware systems for our customers on a daily basis. We are also capable of handling out of area or out of state laptop repairs through our Tech Repair Center. You can ship your laptop to us and we will do the rest.